Download the report (5 pages, printer-friendly PDF format). 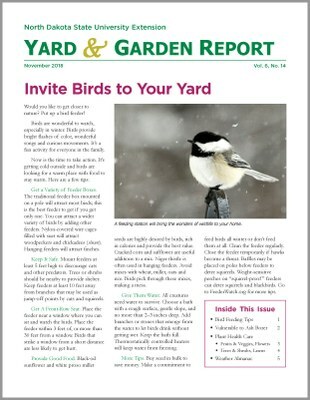 Invite Birds to Your Yard. A bird feeding station will bring the wonders of wildlife to your home. What If EAB Came to Your Town? A new inventory of trees in ND towns shows how vulnerable we are. Plant Health Care. 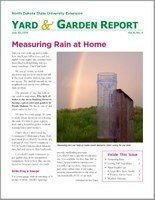 Tips on irrigating evergreens, mowing, cleaning the garden and much more!. Weather Almanac. A summary of temperatures, rainfall and other weather data across ND. Download the report (4 pages, printer-friendly PDF format). Homemade Apple Cider. 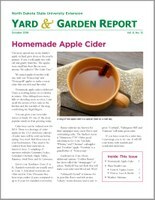 Grow and blend your own cider. Enjoy a special treat on a cold day! Plant Health Care. Tips on storing produce, growing bulbs, wrapping trees; and much more. Weather Almanac. A summary of frost dates, temperatures, rainfall and other weather data across ND. Stunning Fall Flowers. Fall is a special season and there are perennials that sparkle now. Plant Health Care. Tips on ripening tomatoes, harvesting pumpkins, planting tulips, and more. A Worthy Foe. 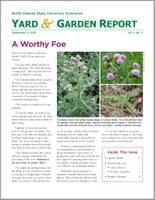 Now is the time to attack Canada thistle, one of most difficult to control weeds. Plant Health Care. 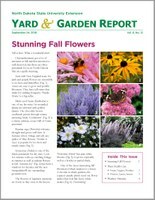 Tips on mowing, planting acorns, overwintering geraniums, and much more. Something Special About Yew. 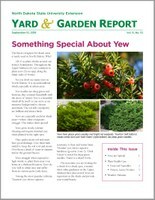 Yews are superstars in the shade and provide year-round beauty. Plant Health Care. Tips on harvesting pumpkins, pruning raspberries, dividing peonies, planting trees and garlic, and much more. Weather Almanac. A summary of temperatures, rainfall and other weather data across North Dakota. 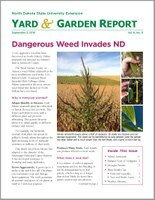 Dangerous Weed Invades ND. The "most troublesome weed in the USA" has come to North Dakota. Bumper Crop of Crabgrass. Crabgrass has thrived over the past two summers. It's everywhere! Drought Persists. Soils in much of our state remain dry. Temps are cooler but we need rain. Plant Health Care. 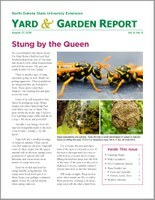 Emerging pests and timely activities for your yard and garden. Stung by the Queen. Learn how to fight back against wasps. Cucumber vs. Tree. Wild cucumbers grow aggressively; sometimes on top of trees. It Has Been Dry, But There is Hope. Soils in much of ND are dry; rains are beginning to provide relief. The Toughest Tree in the West. 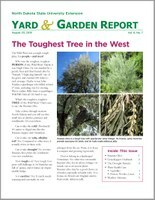 Russian-olive thrives under frigid temps, drought and salty soils. Grasshopper Outbreak. Learn how to stay one step ahead of grasshoppers. The Drought Returns. Over half the state is suffering from dry conditions. 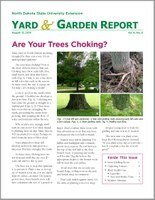 Are Your Trees Choking? Many trees in North Dakota are being strangled by the own roots. A Touch of the Prairie. Ornamental grasses are perfect perennials for us. Look at these superior cultivars. 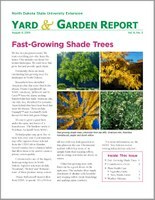 Fast-Growing Shade Trees. These trees provide quick shade for landscapes. Countdown to Frost. Will your tiny tomatoes and pumpkins ripen before frost? Measuring Rain at Home. Make an informed decision when watering your yard and garden. Sow Fall Vegetables. Fall is the best season to grow radish, spinach and many other greens. Tree-Eating Sharks. 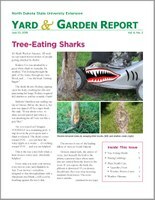 In honor of Shark Week, we discuss how mowers terrorize trees. You Can't Buy Friendship. Ladybugs are great friends in the garden, but don't buy them. Download the report (6 pages, printer-friendly PDF format). Healthy Tomato Vines. 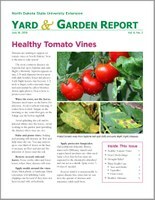 Now is the time to protect tomato vines from diseases. Summer Blizzard. Sweet mockorange is covered with snowy blossoms in June. Drought Relief. A comparison of our drought status today and a year ago. Non-Stop Blooming Wild Rose. 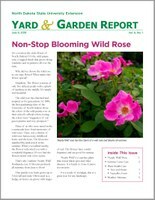 'Nearly Wild' has the charm of a wild rose and blooms all summer. Super Summer Lawns. Tips on caring for your lawn this summer. Plant Health Care. Emerging pests and timely gardening activities for your yard and garden. Written by Tom Kalb, Extension Horticulturist, North Dakota State University. Go to the Archives for previously published issues.